While examining this Blood Droplet Moth at the Newfoundland Insectarium and Butterfly Pavilion near Deer Lake in Newfoundland, Canada, the orange and brown hues on this insect are very prominent. On the hindwings, a thin brown border extends along the lower parts while the upper wings have a unique pattern of orange and brown. Two long, brown antennas extend from the sides of its head with a long feeler located in the middle. The body darkens towards the rear making the wings appear more transparent than they already are. 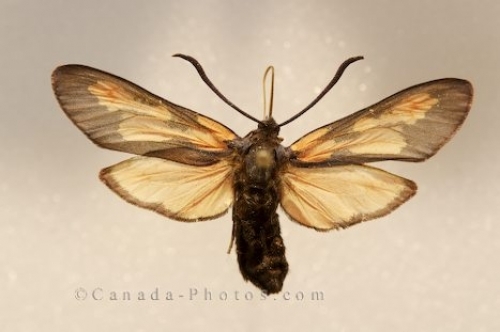 Not many find a moth to be overly pretty but while touring through the Newfoundland Insectarium and Butterfly Pavilion in Newfoundland, Canada, one may walk out of there with a different outlook on the Blood Droplet Moth. Picture of a Blood Droplet Moth at the Newfoundland Insectarium and Butterfly Pavilion in Newfoundland, Canada. Blood Droplet Moth, Zygaena filipendulae, at the Newfoundland Insectarium and Butterfly Pavilion near Deer Lake, Highway 430, Viking Trail, Trails to the Vikings, Northern Peninsula, Great Northern Peninsula, Newfoundland, Newfoundland Labrador, Canada. The Newfoundland Insectarium and Butterfly Pavilion was opened in 1998.